I was kind of on an okra kick this summer for some reason. It’s definitely an overlooked vegetable and that probably has something to do with the fact that when cooked or eaten, it has a very viscous quality that some people don’t enjoy. It also has a kind of hairy outer skin, which is a little off-putting to a first-timer. I grew up eating okra in various forms (in soups, with tomato sauce, with ground beef, etc. ), nonetheless, I became a true okra fan when I tried my first pickled okra at Sunset Bar and Grill on Brighton Ave. in Allston, MA. It came on the side of one of their Mexican themed dishes and it was great! It was lightly sour and had a hint of spicy heat that went great with the refreshing crunch of the okra. In addition to a tasty okra on the side, Sunset offers around 112 beers on tap and honestly one of the best pub-restaurant type burgers I’ve had in Boston (they use a beer steaming process, which is what makes these burgers so unique). Anyway, the point is that I enjoy pickled okra and I wanted to make some myself. Wholefoods sells a pickled okra product by Rick’s Picks called “Smokra” and it is delicious. The spices are a little on the heavy side, but they do a good job balancing the sourness of the vinegar with the heat of the spices. 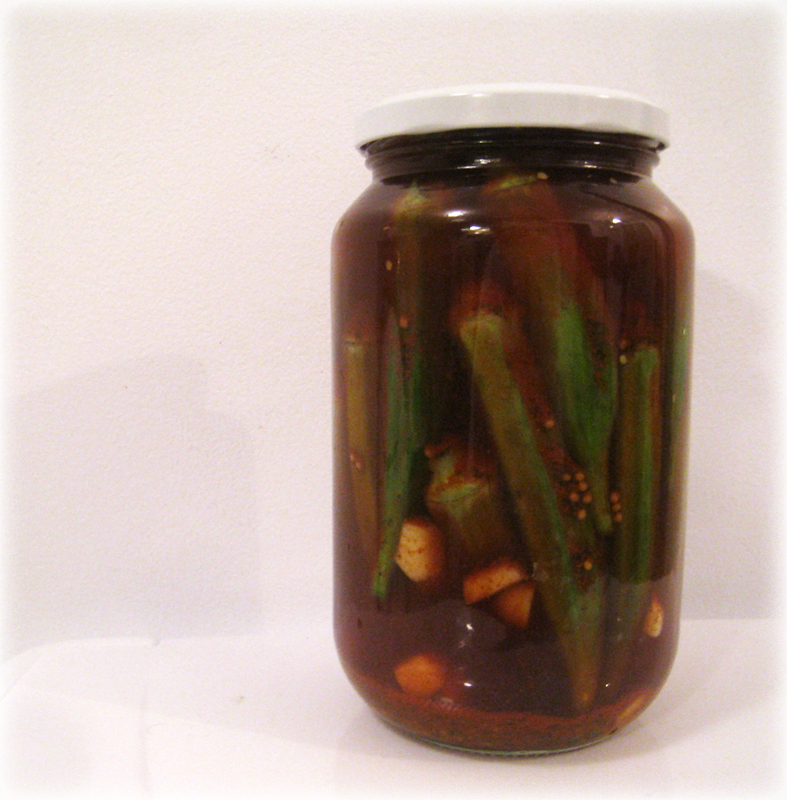 The below is my copycat recipe for recreating smoky pickled okra at home. You can also use this recipe for cucumbers, carrots, or other vegetables, but the smokiness can be too much for a cucumber. 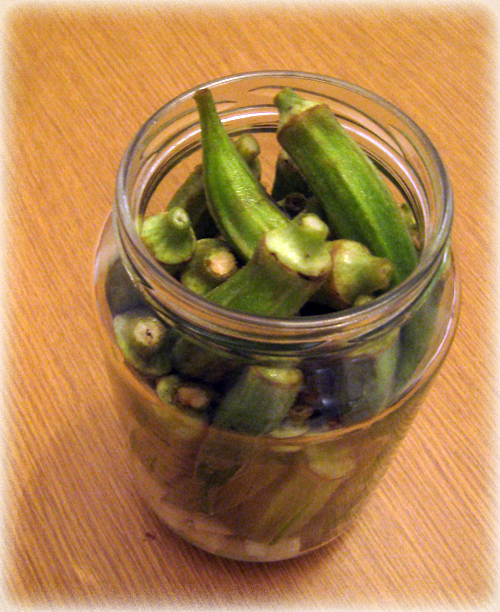 Please note: This is NOT a true canning process recipe, so the okra must be refrigerated. You can make this recipe using a true canning process that includes boiling the jars, lids, utensils etc., but I have not done that here, so always refrigerate. Note: If you don’t have kosher salt, you can substitute regular salt, but you may need to add a little more. 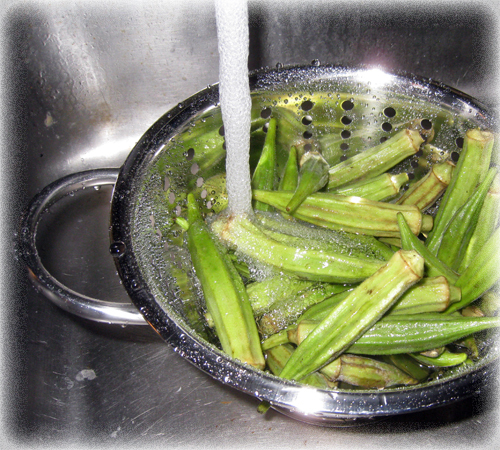 Wash the okra thoroughly (sometimes there is dirt on them) in a colander or a bowl and then drain the water. Pour the water into the pickling jar until it overflows and over the cap (this is just to sterilize everything a bit, although possibly unnecessary). Let it sit while you prepare the brine. Note: If you do not have a pickling jar or a canning jar, this could shatter your jar, so be careful! In the small sauce pan add the cup of water and the cup of vinegar and bring to a boil quickly, stirring frequently, and then lower the heat to a simmer. Add the salt and sugar to the mixture while stirring to make sure it dissolves well. Add the mustard seed and dill and stir the ingredients. Turn the heat off under the mixture and wait until it stops boiling. Add the smoked paprika, the cayenne pepper, and the optional curry powder while stirring the ingredients in. Note: If you add the ingredients in step 8 too soon to the boiling liquid, you will cough uncontrollably if you inhale near the pot. So be careful breathing around the hot ingredients! Roughly chop the six cloves of garlic into 1/8 or 1/4 inch pieces. Empty the jar of the boiling water. Use oven mitts or something, so you don’t burn yourself. Stuff the jar with okra. You should be able to fit it all in a 32 oz. jar and it should be pretty packed in there. Carefully pour the brine into the jar and over the okra. Try to fill the jar almost to the top, but leave an inch or so of room so that the heat doesn’t create too much pressure. I usually do this in the sink because the liquid is kind of stinky and I don’t want to spill it anywhere. Note: You can also try this recipe with a “cold-brine” process by letting the brine completely cool down and then adding it to the jar of okra. This will require at least 3 days of brining though. 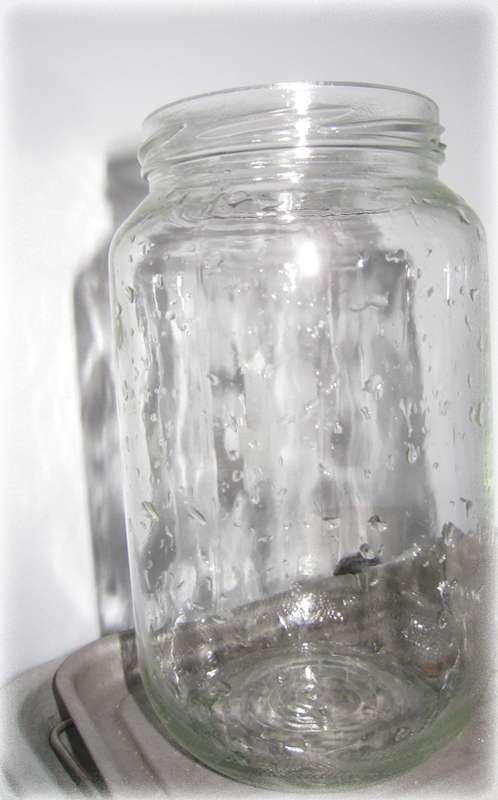 Cover the jar with the lid and immediately run the jar under cold water from the tap. This cools the liquid in the jar a bit, so that the pressure doesn’t build in the jar. After running it under the faucet, place in the fridge and let sit for at least two days (I like to shake the jar once or twice a day to get the ingredients mixed). The cooling process will seal the lid on the jar, so when you open it, it will “pop.” Then eat! You can eat the okra as is, but I also suggest serving it at barbecues or on the side with a burger or mexican food like tacos. Also goes great with hummus!